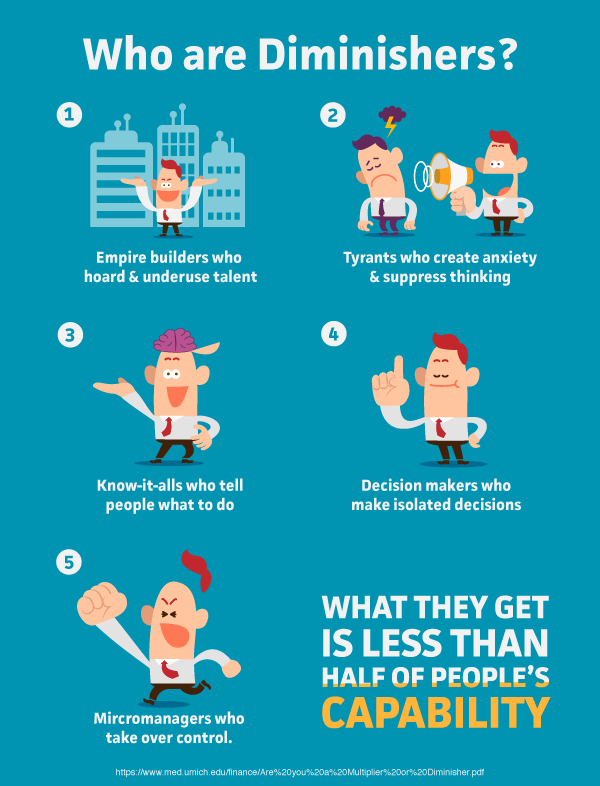 What Type of Leader Are You? A Multiplier or a Diminisher? Have you ever worked with or for someone that made you feel weak, dumb or incompetent? Most of us have. If we go back to that period, there’s a strong chance that your previous colleague got far less from you than your best effort. Liz Wiseman, author of the book Multipliers: How the Best Leaders Make Everyone Smarter, describes these two types of leaders as “Multipliers” and “Diminishers.” The difference between these two types isn’t based on having good intentions or even intelligence, but instead it’s based on how a leader treats the people around them. 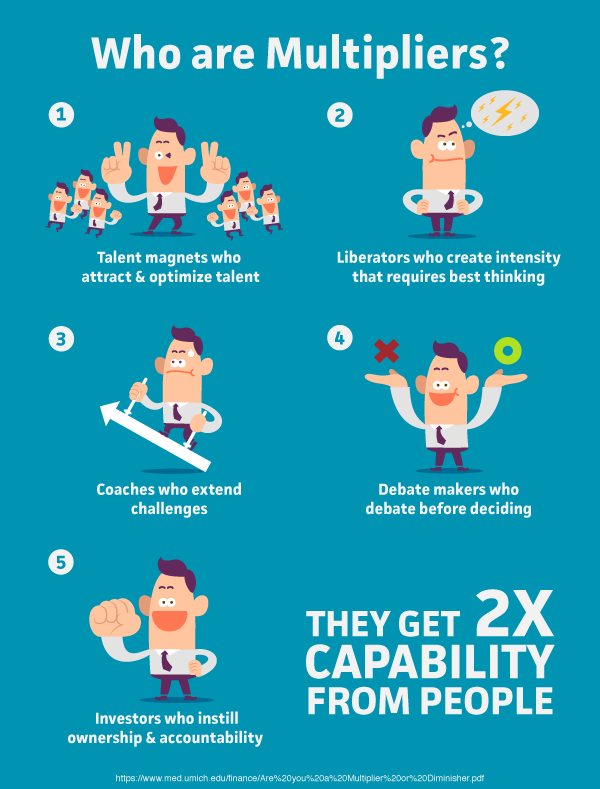 Multipliers see people as smart and capable of figuring out how to solve problems. Diminishers, on the other hand, assume that even smart people need their help. So what qualities define a Multiplier and a Diminisher? Let’s find out. 1. They debate. This includes debating those around them in the decision-making process as well as their employees. 2. They don’t provide easy answers. 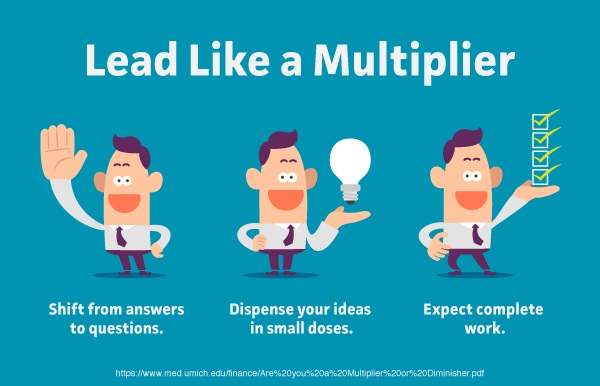 Instead, Multipliers keep people under pressure and ask questions that will help them arrive at an answer. 3. They create challenges. This is a way to create intensity, which will get people’s full attention, effort and best thinking. 4. They hold people accountable. Accountability helps others feel that they have ownership over their actions, so Multipliers hold their teams to account. 1. They think too big. “Visionaries,” as Wiseman calls them, are good at seeing the grand vision of a plan, but bad at connecting the dots for those around them. What happens in these cases is a lack of enthusiasm, as people can’t see a way to achieve their goals. 2. They brainstorm too much. A lack of creativity isn’t the problem, but the lack of focus that comes with each new idea is. In many cases, people become frustrated by the constant change in direction and don’t have enough time to see their original ideas through. 3. They help too much. These “rescuers” believe they are helping their team, when in fact they are creating dependency. 1. Learn how to ask the right questions instead of providing what you think are the right answers. 2. If you’re the person with too many ideas, consider holding some back. The fewer ideas you share, the more valuable your existing ideas become. Working with a limited number of ideas also allows people time to work on them and think them through. 3. Expect — and ask for — complete solutions, thoughts and projects. Making your team accountable to come up with solutions to problems will allow them to struggle with the tasks at hand, which will help them grow from their experiences. Now that you have some knowledge of how Multipliers and Diminishers work, pay attention to the people around you and how you react to them. Perhaps it might be even more important to notice how people react to you. If you’re in a leadership position, do not assume you’re the best leader you can be; few people are. If you work for a Diminisher, you have two choices. Start being a Multiplier to him or her, or look for a situation where you can work for a Multiplier.